Book hotel rooms online with us at Vila Gale Lagos Hotel at the lowest rate, guaranteed. 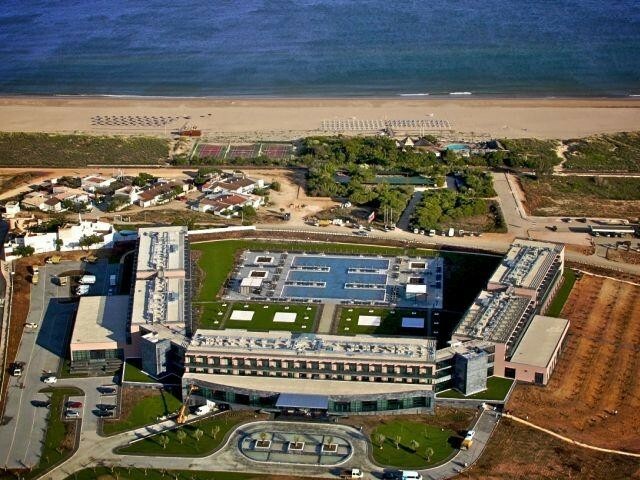 Get your holiday discount room rate at the 4 Star Vila Gale Lagos Hotel is located on Meia Praia just to the east of the town of Lagos in the western Algarve. The hotel is on the seafront facing the long sandy beach and with a panoramic view of the Bay of Lagos. The hotel has 247 suites providing holiday accommodation for two adults and with wheelchair access. They are all well decorated with modern comfortable furnishings. The Vila Gale Lagos Hotel suites have balconies and are equipped with cable TV, direct phone, radio, work desk and a mini-bar. Vila Gale Lagos Hotel facilities include its Satsanga Spa with massages and beauty treatments, an indoor pool, sauna and steam baths, two restaurants, a snack-bar, two bars, an outdoor pool and one for children, Wi-Fi, a Fitness Centre, a Business Centre, a library, a Kids Club in season with a playground, three tennis courts, a putting green, a multi-sports field, a 1.200 sq. metre garden and a games room. The hotel is only minutes by car to Lagos Marina, the historic town and the nearest golf course.